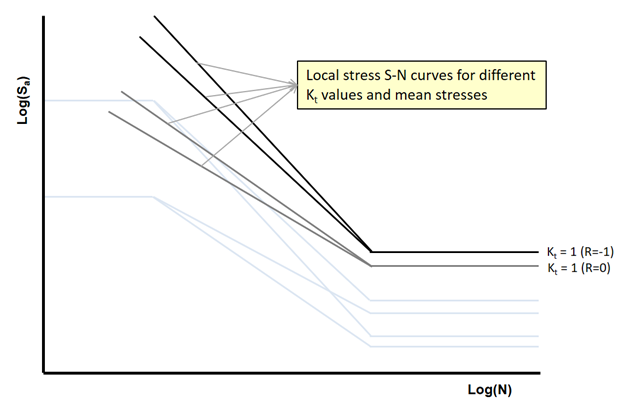 In part 1 of this blogpost it was discussed that also for fatigue analysis using local stresses, the gradient of the S-N curve depends on the stress concentration. But also the stress ratio R=Smin/Smax of a stress cycle affects the gradient. Often S-N curves are given for R=-1. To obtain the S-N curve for a different value of R some corrections are made. The upper asymptote of the S-N curve is determined by the condition that Smax≤Rm. With increasing mean stress level, the upper asymptote will decrease by the mean stress value. The lower asymptote, i.e. the fatigue limit, will also change with changing R, but to a lesser extend. For R≠-1, the fatigue limit gets a mean stress correction according to Goodman, Gerber or some other method. The correction depends on the R value, but also on the ductility of the material. Since the corrections on upper and lower asymptote are different, S-N curves tend to become flatter with increasing R or mean stress. This applies to S-N curves based on nominal stresses, but also on S-N curves based on local stresses (the difference between both is just the factor Kt). Many codes and FE fatigue tools use a fixed gradient with k=5 in de equation (Sa^k)*N=c. In reality, the value of exponent depends on the stress concentration, the stress ratio and the material. Using k=5 is too much of a simplification, in practice values of k vary between 3 and 15. Welded joints can be considered as an exception; using k=3 is acceptable because fatigue of welded joints is independent of mean stress levels and the stres concentrations are that severe that a change in welding detail has very small impact on the gradient.